Senator Gore admitted if the Republicans fielded a strong candidate his reelection campaign would be “a tough race.” Gore also opined Bill Brock would likely be the strongest candidate the Republicans could run against him, but the senator said he did not believe the congressman would run, as Brock was from Chattanooga, which was the home of Estes Kefauver. Throughout much of 1963 there was considerable speculation freshman Congressman Bill Brock would run against Senator Albert Gore. Brock had traveled more than 10,000 miles across Tennessee to help build the state Republican Party. At the end of May Brock was in Greenville, Tennessee along with Congressman Jimmy Quillen speaking to local Republicans at a Veterans of Foreign Wars chapter. Congressman Bill Brock joined Quillen and Congressman Howard Baker, Sr. in appearing before the House Interior and Insular Affairs Committee to oppose a bill, which would have imposed entrance fees to government owned parks. None of the Republican congressmen liked the idea of charging fees for visiting the Great Smoky Mountain National Park. Howard Baker pointed out the bill would violate the terms under which the Great Smoky Mountains National Park was created. Both the State of Tennessee and the Rockefeller Foundation had donated land for the creation of the park and had forbidden tolls or fees; the specific language stated no fees “shall ever be imposed by the United States or any of its agencies” Baker told the committee. “An entrance fee would be highly detrimental to the park and to the economy of all Eastern Tennessee and Western North Carolina,” Congressman Baker said. Bill Brock’s own statement was simple: recreational areas like the Great Smoky Mountain Park should be available to all American citizens to visit and enjoy free of charge. Bill Brock was the only Tennessee congressman to join Governor Frank Clement in traveling to Fort Stewart, Georgia to review the troops in the Tennessee National Guard during the summer of 1963. Congressman Brock, himself a veteran of the U. S. Navy, joined Governor Clement on the reviewing stand as the troops passed by in parade. That same summer, Bill Brock traveled to San Francisco to attend the convention of Young Republicans, but the young congressman was back in Tennessee when Republicans installed George Ed Wilson as Chairman of the state Republican Party. Brock, along with his colleagues Howard Baker, Sr. and Jimmy Quillen, spoke to the gathering, which was focused upon the 1964 elections. The Nashville Tennessean gleefully published a report that Congressman Howard Baker, Sr. felt some resentment towards his young colleague. Since the death of long-time Congressman B. Carroll Reece, Baker had dominated the Tennessee Republican Party. Bill Brock’s rise to Congress had encouraged a younger generation of Republicans to become active and naturally they wanted a voice in party affairs, something Baker seemed to dislike. Baker watched skeptically as several Republicans spoke on the House floor to praise the Chattanoogan after Brock had been named “Young Republican of the Year.” “At first I thought they were going to nominate Brock for vice president,” Baker told a colleague. “Then I realized he wouldn’t accept it.” With the arrival of Bill Brock in Washington, Howard Baker, Sr. no longer had the limelight all to himself and the older man likely did resent the publicity the younger man received from the press. Yet the old order of Tennessee Republicans was to be swept away soon and Baker’s own son would help to usher in a new era along with Bill Brock. Brock was learning how to use the rules of the House to make himself effective. Brock’s effectiveness was evident when Congressman Ross Bass howled when the Chattanoogan attempted to place an amendment to a vocational education bill. Brock voted to recommit the bill because he wished to add a civil rights amendment to the bill, a move Bass claimed was intended to kill the legislation. “The Republicans hoped that by getting a civil rights amendment tacked onto the bill they could defeat it in the same way they have tried to defeat other progressive legislation in the past,” Bass huffed. 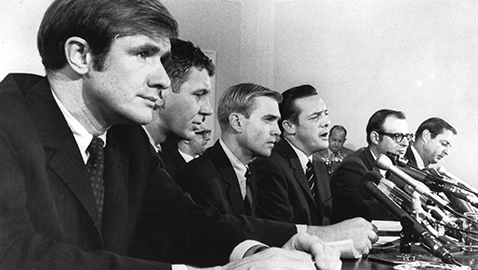 The motion to recommit the bill to the House Education Committee failed on a vote of 217 – 181, but Bill Brock was making himself heard as a freshman congressman. Tennessee politics and the 1964 elections were roiled by the unexpected death of Senator Estes Kefauver on August 10, 1963. Kefauver’s death meant Governor Frank Clement had to appoint a senator and both of Tennessee’s seats in the United States Senate would be on the ballot in 1964. Speculation had been rife Brock would challenge Albert Gore for reelection in 1964, but some believed the Chattanooga congressman had been thinking of waiting until 1966 to run against Kefauver. Kefauver had been in the Senate since 1949 and his sudden death left both Democrats and Republicans unprepared for another statewide race in 1964. There was no lack of possible candidates as both Governor Frank Clement and Congressman Ross Bass were eager to go to the Senate and some wondered if former governor Buford Ellington might be interested. Ellington, more conservative than Albert Gore, had been touted as a candidate for Gore’s Senate seat. Some Republicans speculated Congressman Howard Baker, Sr. might be a strong candidate for the United States Senate, if he would run. Baker had run for governor in 1938 and the United States Senate in 1940, but it was unlikely he would give up a safe seat in Congress to make a statewide race. Baker would not be a factor in the 1964 campaigns as death would take him suddenly just after the first of the New Year. It would be left to his son and namesake to make his mark in Tennessee politics. That Brock was perhaps the strongest Republican candidate for a seat in the United States Senate from Tennessee was acknowledged by veteran political reporter Joe Hatcher of the Nashville Tennessean. Hatcher believed Brock’s announcement that he would not run for the Senate left Tennessee Republican scrambling to nominate viable candidates for both Senate seats, yet the columnist felt the odds were against Brock winning reelection in his Congressional district. Bill Brock and his Republican colleagues from Tennessee refused to sign a statement circulated amongst House Republicans in opposition to the test ban treaty, an issue leveraged by Senator Barry Goldwater of Arizona, who was seeking the GOP presidential nomination. Supporters frankly admitted the statement was intended to aid Goldwater’s presidential bid. Despite his refusal to sign the test ban treaty manifesto, Bill Brock, along with Congressman Jimmy Quillen, received “perfect” scores from the Americans for Constitutional Action organization. A conservative group, the ACA said Brock and Quillen had supported “sound money” as well as vote “for a private, competitive market, for national sovereignty, and for local self-government.” Fellow Republican Howard Baker. Sr. received a 73% rating from the ACA while Democrats Ross Bass, Joe L. Evins and Richard Fulton received zero ratings. Democrats had certainly not given up on the notion of defeating Brock in his campaign for reelection to Congress. Keith Hampton, Governor Frank Clement’s personnel commissioner, was being urged to run against Bill Brock in 1964. Seen as “the best grass-roots politician in the Clement administration”, Hampton was thought to be a serious challenger to the young Congressman. Many Democrats believed Brock’s initial election to Congress was little more than a fluke. Only narrowly having defeated Wilkes Thrasher, Jr. in 1962, Democrats opined supporters of Congressman James B. Frazier, Jr., a conservative, had helped to elect Bill Brock. The candidacy of Keith Hampton was thought to neutralize those Clement Democrats who had refused to back Wilkes Thrasher in 1962. Unquestionably that was true, yet it ignored the fact the Third District had shown an increasing tendency to vote for Republicans. Richard Nixon had handily won the district in 1960 against John Kennedy and there was reason to believe Kennedy’s personal popularity inside the Third District had not appreciably grown. Bill Brock faced either running for the United States Senate in 1964 or reelection in a district that had long been Democratic. Democrats believed they had a good chance to defeat Brock for reelection should he run for Congress again. Once again, Bill Brock would demonstrate considerable political skill in thwarting his opponents.